Between 9 and 10f March ArcheoCasarano visited some of the most important museums in Berlin, such as the Museum of the Berlin Wall and the Palace of Tears. 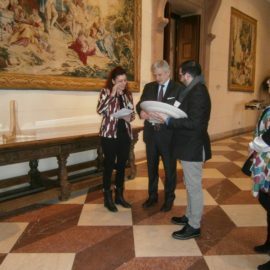 At the end of the tour ArcheoCasarano’s President Alessandro De Marco presented the project “Touch Casaranello” to the museums and specifically to the touristic guide Monia Manganelli, who is responsible for the cultural heritage in Berlin. She was presented with a canvas bag sponsoring the project “Touch Casaranello” and some brochures of the church. In this way the association wanted to establish collaboration between the responsible of the cultural heritage of the European capital and the city of Casarano (LE). On 10 March the association had the opportunity to visit the Italian Ambassy in Berlin. They were warmly welcomed by the School Director of the Ambassy Anna Maria Marzorati. After the greetings, they had the honor to meet the Ambassador Benassi, to whom they presented the activities of the project sponsored by the Presidency of the Council. The Ambassador was presented with a philatelic bulletin and the stamp dedicated to the Church of Santa Maria della Croce – issued by the Italian Ministry of Economic Development upon initiative of the Association ArcheoCasarano – a brochure of the church and an ornamental plate decorated by hand with the decorative motifs of the paleochristian mosaics present in Casaranello. 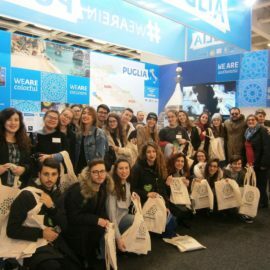 In all these meetings the association was accompanied by the students of the Scientific High School G.C.Vanini of Casarano, who contributed with passion to promote the church of Casaranello within the work-study project “Origins and Future 2”. 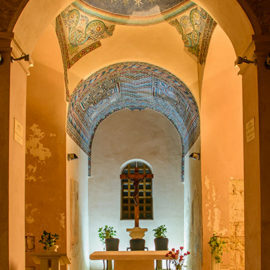 Sacred art, history and culture in one of Apulia’s oldest churches.